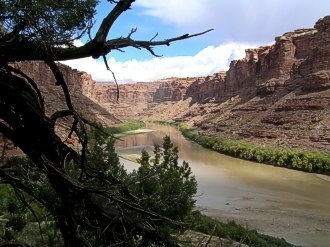 Rochelle, Sienna, Damiana, and I canoe down the lower 52 miles of the Green River, rightly called Stillwater Canyon. 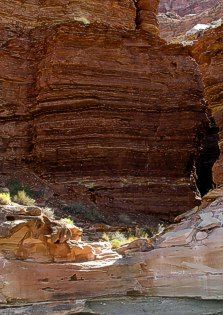 Dropping just a few dozen feet, the Green meanders between sandstone cliffs that tower as much as 2,000 feet above. 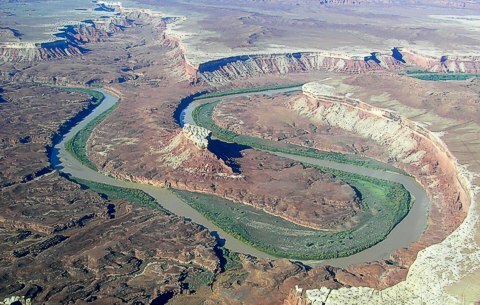 This is true, precious, powerful wilderness; during eight days on the river, we see fewer than 40 people. Passing through such wilderness, life's elements -- moving, finding and making camp, preparing meals, packing up and moving on -- take over. 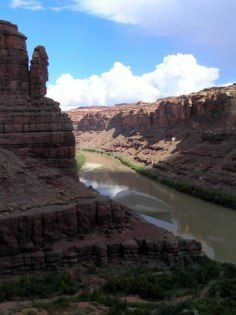 Knowing that this benign place can quickly become harsh, we dedicate ourselves to the details of safe passage, and become part of the river's rhythm and reality. 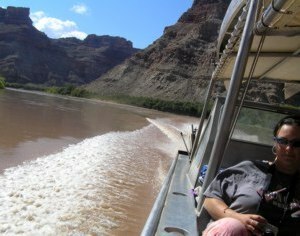 We float down the river at three or four miles per hour, passing through a winding museum of geology and sculpture. 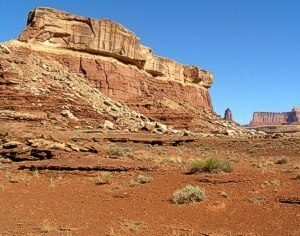 Seeking current and the shade of towering cliffs, avoiding mudbanks and sandbars, our goal is seven miles a day. Reaching our quota, we look for a good haul-out and camp. 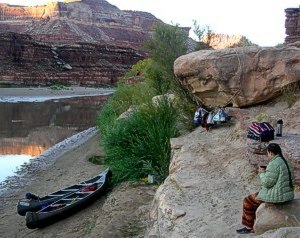 With only our tents and sleeping gear on the flat above, we set up our kitchen and stored our other goods on a sandy ledge beside the river, establishing a pattern we continue at subsequent camps. At the end of our third day, we find our first exceptional camp, on the broad abandoned river bottom of Anderson Bottom, where the river cut through a narrow point and shortened its course by two miles. 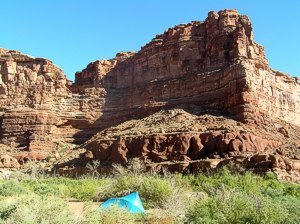 Under a spreading cottonwood, we make camp where many have camped before, surrounded by red cliffs. We find our fourth camp at mile 21, after the sharp bend around Turks Head, on an abandoned beach furnished with large boulders. Here, the kitchen is on a comfortable lower ledge, the bedrooms on the broad sandy abandoned beach above. The nearly full moon plays with the river and canyon walls, illuminating the "ruins" on the wall behind our sleeping beach. In the bright moonlight I climb high above the camp, and determine that we should pack quickly next morning and explore the plateau above us. Near the river, life is riotous, dominated by tamarisk (an invasive mistake almost as bad as gorse.) 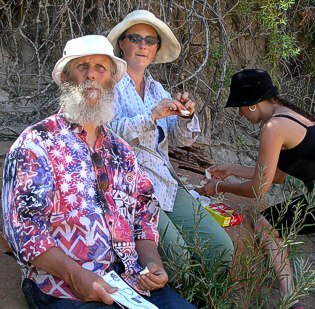 Away from the river's alchemy -- the magic of flowing water in a desert -- the plants and rocks are sere and thrifty. On the fifth day, we make great progress downriver, paddling all the way to Jasper Canyon at mile 9.5, where we find our last Green River camp. 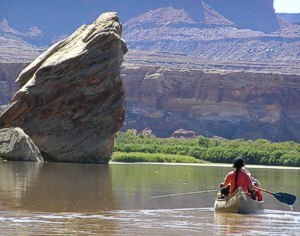 Ahead of schedule, and with an easy last day's paddle to the Confluence, where the Green and Colorado Rivers meet, we decide to take a day off. We eat the last of our fresh food, enjoy our last salad, and watch moonlight replace sunlight on the night before the full. Knowing that we would not have to pack up and travel on, we linger around the campfire, watching the satellites and jets, and enjoying solitude. On this day we see no one. At the "box" end of the canyon, where water falls hundreds of feet from the wash on the plateau above, we find a seep, falling water, a pothole, and a small pond in the perpetual shade. Starting slowly on the sixth day, enjoying the last of our sausage, we watch the sun slowly penetrate the deep lower canyon. 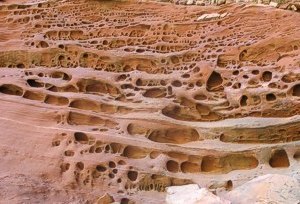 Rochelle stays in camp and relishes a bit of relaxation while Sienna, Damiana, and I scramble into Jasper Canyon, a narrow watercourse filled with a tumbled maze of enormous rocks. From this slippery promontory we carefully descend past resident Junipers. For the first time in a week, clouds begin to march across our narrow sky, promising a change in the weather. 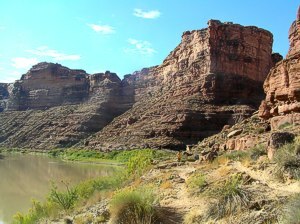 We scramble out of the box canyon across a talus slope littered with fossilized clams and out to a wide view of the ox-bow bend of the Green river, our campsite far below. 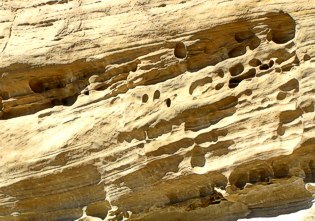 Life here adapts to flood -- cloudburst -- or drought, clinging tenaciously to the ancient canyon walls. 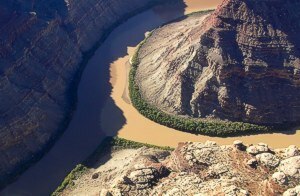 Little has changed here; these trees witnessed John Wesley Powell's expedition in 1869. 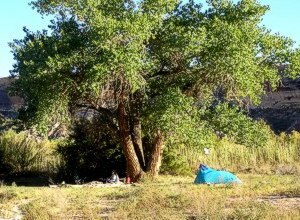 Compared to the Green, the Colorado is crowded: we see a dozen people, and at night can see another camp half a mile down and across the river. After a stormy night, we break our Jasper Canyon camp and repack our freight into the canoes for the last time. As we paddle toward the Confluence, showers leave us and the clouds begin to break up. Almost before we know it, we are at the end of the voyage. 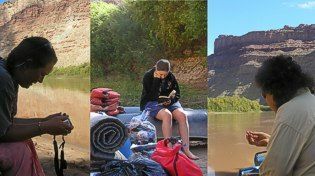 We camp along the Colorado just below the Confluence, eat a meal of snack foods and special treats, and prepare to leave the river. It rains again just after we go to bed, but we are snug, and laugh at the weather. Nearing noon, our jetboat arrives, collects our gear, and we embark. Back in the 21st Century, we zoom upriver. The adventure may be over, but its discoveries will linger, I imagine, for the rest of our lives. This account barely scratches the surface of what recedes into our past but continues to loom large in our lives. What a gift! to be away from the hurley-burley of politics and modern life for a week! Not a trip for everyone -- get used to being dirty, silty, wet; get used to new muscles and stretches -- and thankfully so. The hardship and distance account for the solitude. Before the trip was over, Sienna and Damiana were plotting for another trip next year.